Artists need to know their colours. If you would like to be an artist you need to know all about how colours are made by mixing colours together. Primary colours are the building blocks of all colours. From these three colours, along with white and black, we can make just about all the colours we can think of by mixing them together in different amounts. A good way to remember why these colours are so special is that we can’t make these colours by mixing other colours together. No matter how hard I try, I can’t mix red, I can’t mix blue and I can’t mix yellow. Black and white are special. Technically they aren’t even called colours. Black and white are used to make colours darker or lighter. Are there other Primary Colours? 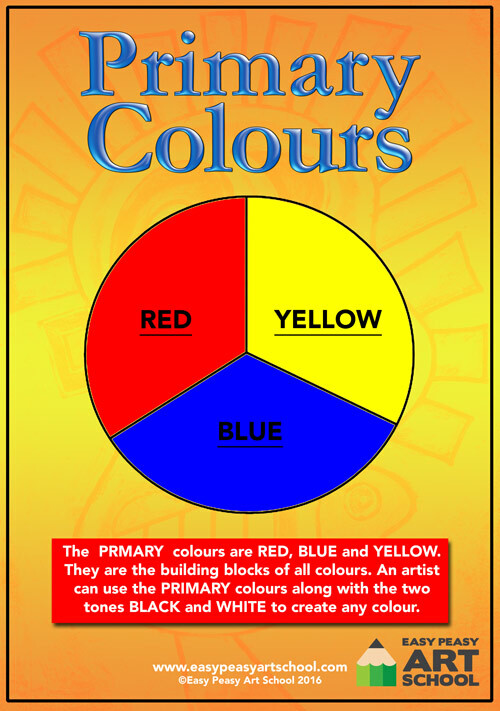 In art, we use what is called a Red, Blue, Yellow colour wheel. But in other areas different colours are used as primary colours. For example in science or on your computer, a Red, Green, Blue or a Cyan, Yellow, Magenta colour wheel may be used to describe how colours are created. To further your colour knowledge, don’t forget to read our other blogs on secondary, tertiary and complementary colours. If you would like a print out of our colour wheel posters, have a look on our website under LESSONS > OTHER > COLOUR WHEELS. Here you will find printable colour wheels available in both English and U.S spelling.